The last known picture of this missing dog has touched hearts around the world. 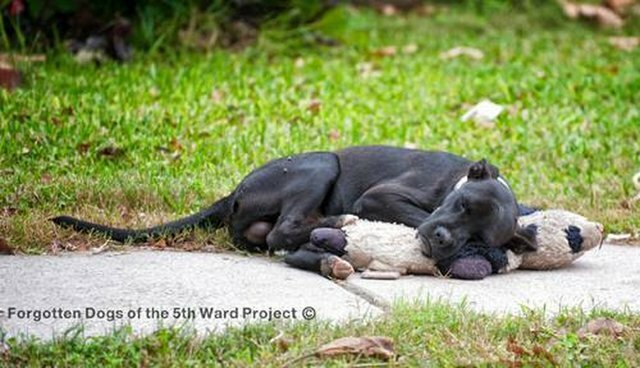 Since The Dodo first wrote about the dog seen cuddling a tattered teddy bear, more information has emerged - thanks to followups from Yvette Holzbach, a volunteer with Forgotten Dogs of the 5th Ward. Writing in a Facebook post, Holzbach says she found the dog's owner, an 89-year-old man identified only as Calvin. The Houston resident told her the dog was among several he had rescued from the streets of his neighborhood over the years. But the dog ran away. "He told us that he was a dog that did not want to be contained," she wrote in the post. "He was forever jumping the fence and he could do nothing to keep him in. One could see where he had attempted to close up holes or raise areas of the fence. But he said that a while back his dog disappeared." That was around the time Holzbach was passing through the neighborhood. She spotted the dog with his unlikely stuffed companion. 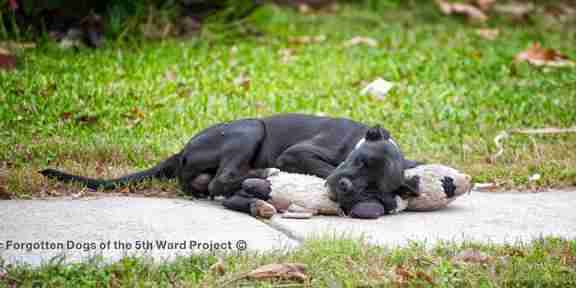 "When I first saw this dog lying on this tattered and torn soft toy my first reaction was, 'Oh how cute is that?'" she wrote on her Facebook page. "Reality sunk in once I started taking the picture. Here is a stray dog taking comfort in a worn-out, discarded toy." But Holzbach couldn't take this dog with her that day. The rescue didn't have the space. She kept returning to the area, searching for the dog. But he was gone. Along with his toy. More than a month after the image was taken, the dog has still not been found. "I hope that by posting the picture awareness has been raised to the plight of the street dog," Holzbach wrote. "We are facing an uphill battle and we can only hope that there will come a time when no dog will have to struggle to survive on the street." Through her rescue, Holzbach tries to save as many dogs from the streets and shelters that she can. If you have any information on where this dog may be, get in touch with Forgotten Dogs of the 5th Ward through its website or by sending an email to info.5thward@gmail.com. And consider supporting the group's mission to leave no dog behind.